The rugged and rocky landscape of Arizona, Utah and Nevada hold many awesome treasures that can be found easily off the roads. Out near the north rim of the Grand Canyon on the Utah/Arizona border there’s this cool Horseshoe bend in the Colorado river on an Indian reservation. It’s about a 20 minute hike from the parking area to the rim of the canyon, and not an easy hike if you’re out of shape, but well worth the pay off. There are no guard rails to keep you from falling so you’ve got to be cautious where you decide to shoot from as the rocks are slippery and covered with sand. The day I shot this there must have been a hundred other cameras going, and I knew I wasn’t shooting anything that unique, but I love the results and felt it worked well in the overall series of images. The whole area is just Heaven for landscape shooters with St. George, Lake Powell, Monument Valley and Ship Rock all within a few hours drive. This trip for me was more of a scouting expedition as I’d like to spend a week or so out here shooting day and night. Long night exposure especially. The day before I shot a scene of the road after a rain storm while heading to a BLM campsite. The light is just awesome out west. October in the Dakotas is a particularly dry time of year, and it’s not uncommon to see smoke from the many controlled burns used to keep the grass lands of the Ogallala region in check from natural or man made fire starters.This fire was a mixture of both smoke and dust from the eroded prairies that was being carried by a strong wind storm. I was out in the Dakotas-Nebraska area checking out some off beat locations with my recently acquired D700 when I spotted this while leaving Crazy Horse. As I was heading south towards Alliance, NE. I saw this cloud of smoke and went up a hill to check it out. The road I had come up was smoggy as heck from the smoke/dust being blow all over and there was a grit that you could taste in the air. I found a forrest service truck with a Ranger monitoring the fire and inquired what was going on. He mentioned that they had a controlled burn that ran wild on them from the wind that morning, but it was under control now. I notice how the smoke and wind together made a eye shape that was kinda cool. who could resist shooting this? and even better, the only people seeing this perspective were myself and the Ranger. I got busy snapping a few test shots and realized that the best way to get this would be to shoot a series of verticals and stitch them together since I lacked a real wide angle lens. Being that it was 5pm, and I was looking S-SE, the natural light was on my side. I set up a tripod and did two passes with about 7-9 images per series. In all, I was on the scene for maybe 10-15 minutes then on the road again looking for the next shot. 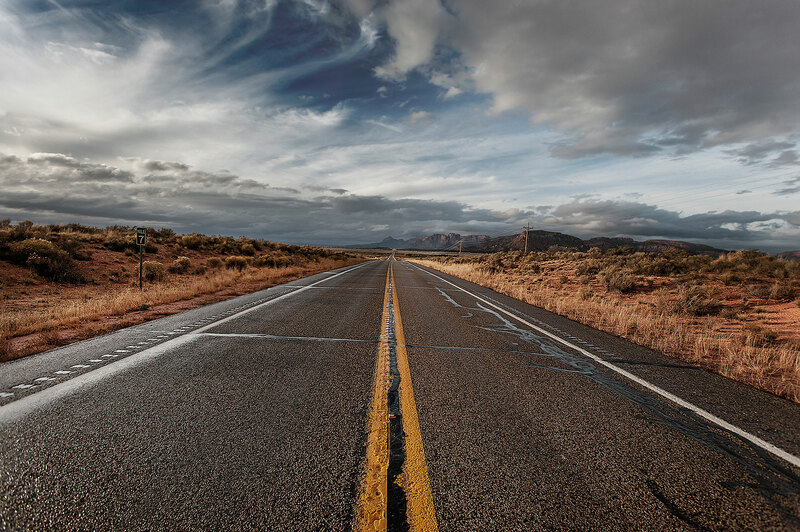 Photo road trips are an inexpensive & awesome way to spend your time off. They allow you see things that put life in perspective, because were all small in the eyes of the universe. Maps Showing the Pro Photography Landscape in the United States. The actual park itself, I’m sure is a 9-5 deal, although, I’ve shot here at 3am with no issues. 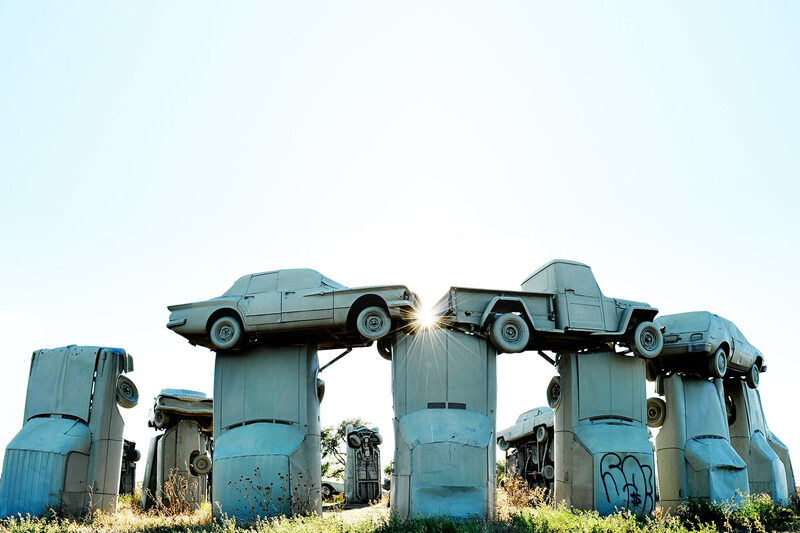 I don’t recall how I found out about Car Henge, if it was thru an road trip blog or elsewhere, but it’s been a great place to go get creative over the years. Located in Alliance, Nebraska, It’s always on the road plan when I travel to Denver, Las Vegas or LA. This image was captured in the winter of 2013 while I was deciding between living in the midwest or moving out to the west coast. I stopped off in Alliance around 4:30am to stretch and take a few shots at dawn. I had seen a few cool sunrises on my way back home and was hoping that this mornings would be similar. It turned out a little more subtle than the previous days, but I liked the look of this shot for the mood of the year. It also juxtaposed well with an earlier shot I had made at sunset in 2010. If you are hitting the road for vacation this spring or summer and crossing Nebraska, try and stop off here to see this cool piece of America before some zoning committee or Wal-Mart tears it down. I-94 is the only interstate image to be a part of my Miles Between collection. The Interstate & this place in particular recall many childhood memories. Movies at Vali-Hi drive in, vacations to our cabin or heading to my dads car dealership every Saturday to name just a few. Before there was a bridge here to safely make a photo from, the road just T’d up with the major Interstate. You’d have to play a game of “Frogger” to cross it because it was so busy. As you’d expect a major interstate to be. But this was the 80’s and the highways were still in-between the Eisenhower era designs & Reagan era updates, so there were a lot of whacked out intersections like this. I grew up on the road that T’d up there. Neal Ave.
My parents would drive us thru this crazy intersection often as kids. It was the most direct way to get to Stillwater, and all the other cities north-east of our home. It was also notorious for bad car accidents, many fatal. There was-still is, a 1800’s era cemetery off the westbound lane. The highway department just built around it. When I was a kid, my mom would take us out there often to “help” cut the grass & tidy up the monuments to keep them from disappearing in the over-growth. We’d do more exploring than helping, but my mom didn’t seem to mind. I’d get to play like a young “Indiana Jones” creating rubbing impressions on tracing paper of the weathered headstone’s while my mom ran the “clacky” sounding 2 tone John Deer push mower. I notice today that someone still keeps up the cemetery, not sure who? Wonder if their kids do the crayon rubbings? My idea for this image centered around the idea of “taking off” and “exploring the unknown” like a rocket launching an astronaut into space. A lot of my life journeys have started here on this path, many were steps into the unknown or leaps of faith, like joining the Army at 18 or getting married. I decided using a long exposure from the bridge would be the best way to play this idea off and get what I was looking for. Fortunately, the bridge is really wide and had a side area for bike traffic that works well for setting up a tripod. After several exposures with varying degrees of success, I spotted a large convoy of semi’s approaching, lit up like airplanes. I opened the shutter while the road was empty in the view finder, about 10 seconds before the first truck in the center lane came thru followed by 5 more in various lanes. Less than 10 minutes and I had my shot, and a little piece of history as I see it. 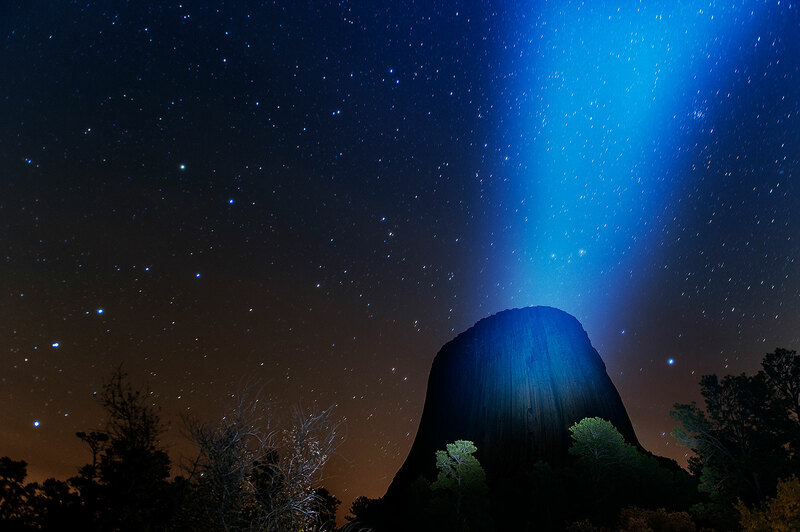 Devils Tower, in Wyoming, is famous for many reasons, particularly in popular culture as the center piece of Steven Spielberg’s movie “Close Encounters of the 3rd Kind”. It was also one of Americas first national parks. 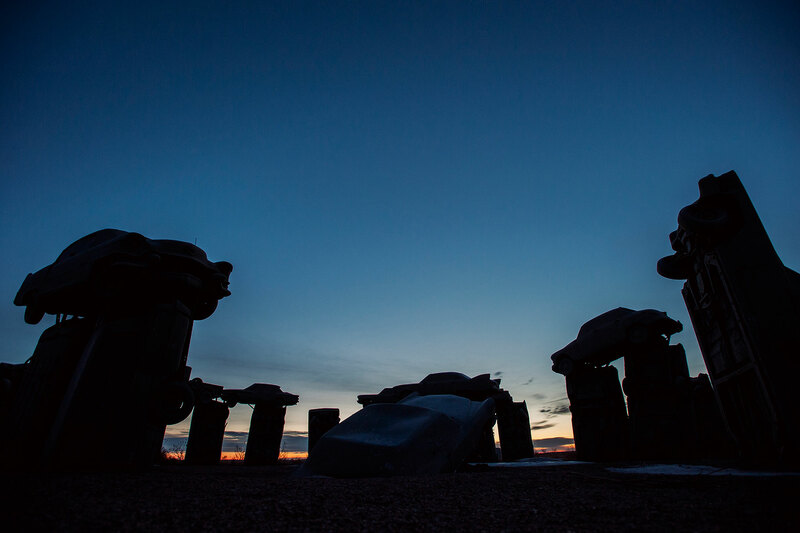 Established in 1906 by Theodore Roosevelt, it has a rich history with the Lakota Indians & other tribes of the area who’s folklore tells a tale of 2 girls who went out to play, were spotted by several giant bears, who began to chase them. In an effort to escape the bears, the girls then climbed atop a rock, fell to their knees, and prayed for the Great Spirit to save them. The Great Spirit made the rock rise from the ground towards the heavens so that the bears could not reach the girls. The Indians named the tower things like “Aloft on a Rock”, “Bear’s House”, ” Bear’s Lair” & ”Home of bears” The name Devil’s Tower originated in 1875 during an expedition led by Col. Richard Irving Dodge when his interpreter misinterpreted the name to mean Bad God’s Tower, which then became Devil’s Tower. I made a trip to photograph it in 2010, but found my initial results disappointing. In 2012, I decided to try again with an epic 12 day road trip across the top of America from Minneapolis to Washington State, then south on PCH all the way to Los Angeles. 12 days to shoot whatever I wanted. It was great. The only rule was to never hit any interstates, just 2 lane roads as much as possible and see small town America. “Miles Between” was born. I set off from Minneapolis on Highway 212 October 15th. 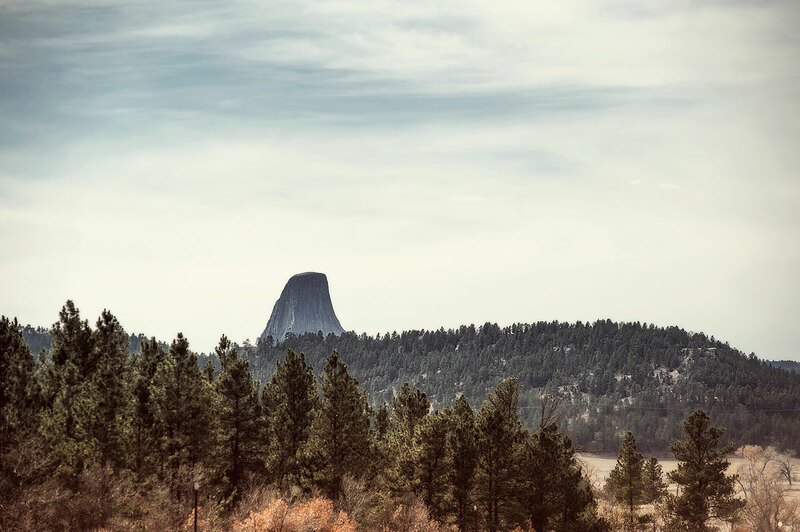 After driving for 10 or so hours, I came upon the Devils Tower National Park and the monument itself, which didn’t stick out all that well in the pre dawn darkness. I had hoped to get an earlier start and arrive there around 1-2am for a few long exposures, but as travel and traffic would have it-4am would have to work. Entering the park, I followed the road to a parking lot at the base of the tower. Man it was dark, cold and kinda freaky outside! I set up my tripod outside my car and rigged a remote so I could sit in my car and stay warm ( and also, because it was pitch dark and I had no idea what kind of animals may have been roaming around the park) Luckily, I found out later it was a brave idea to stay in the car as I was surrounded by vicious, blood sucking Prairie Dogs that woulda killed me for sure. The tower is a dark, light eating rock, as I mentioned earlier, that was not easy to see in the darkness. Fortunately, I had a spot-light style flash light that I could use on the tower to focus my lens on the features. I was using a Nikon D700 w/24-70 2.8G, which is normally awesome in low light-but this was no light-so it was up to me to do everything manually. No prob, thats what infinity is for on the lens right? So this shot, my hero from the day, was actually a mistake. Well, maybe not a mistake, but definitely not the shot I was aiming for when I pulled in. This was the first year I had tried long exposures at night with any success, and my formula was to do a test shot at higher ISO, then use reciprocity to recalculate the similar exposures at lower ISO. Easy peazy. I relate long exposures to cooking, because once you know all the ingredients and mixed it up, it’s just a matter of waiting for it to be ready. Even with all that strategy, there are also happy accidents-like this. The image above was actually meant to be a set-up or test shot for focus. I had rigged the spotlight on a stand, with my camera set low to the ground, I peeked thru my view finder to set the focus. Once that was set, I tripped my shutter release to see what kind of exposure would result from ISO4000 F2.8@ 30 seconds. About halfway thru the exposure, I realized the spotlight was still on. I was tired and prone to errors after traveling and jumping into shooting. This error, however would result in one of my favorite images and certainly one of the more unique shots that anyone has made of this iconic American treasure. I made a few other long exposures before the dawn light took over and the day arrived, but this was the stand out. The afternoon was beautiful & the light was soft which allowed me to make one last hero portrait as I hit the road west. 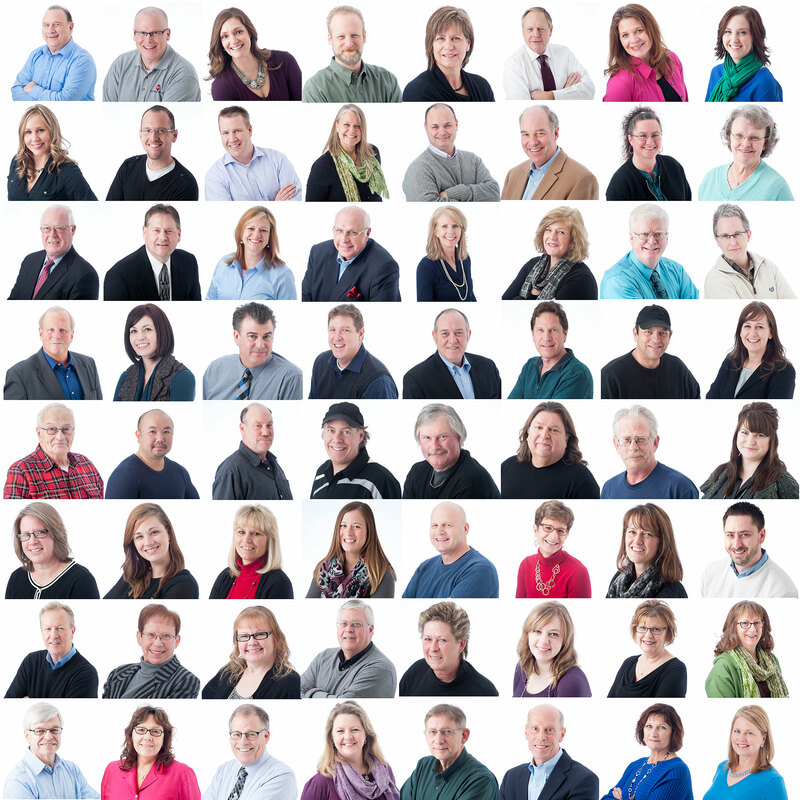 Thanks and stay tuned for more stories behind the image.